Participants will need all their energy for the start of the race when they make their way from Edmund Rice College straight up Mt Keira Rd to Harry Graham Drive. This is the most difficult part of the event as the first 4 km, from the starting line to Byarong Park, are very steep. Once on Harry Graham Drive, participants can breathe a little easier as they head south towards Mt Kembla over 2km of nearly level ground. There will be drinks, snacks and toilet facilities available at Robertson’s Lookout so everyone can take a minute to relax and enjoy the view. From Robertson’s Lookout it is straight on to the finish line which will be at Kembla Heights adjacent to the Mt Kembla Bowling Club. The good news is the last 4km is all downhill. 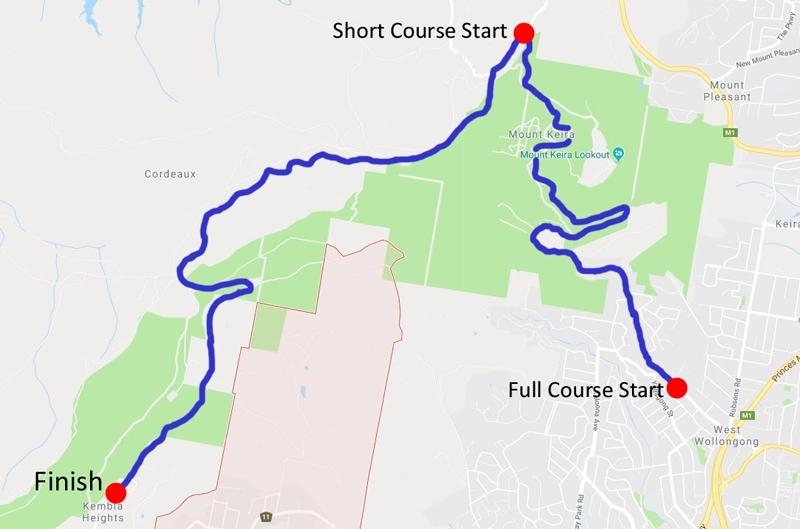 This course starts at the top of Mount Keira and joins the main course as it moves onto Harry Graham Drive. This course was designed to open up the M2M Challenge to some of our older competitors or those who might find the uphill part of the course might be a little too much challenge. Short Course participants will still commence at the main start area at Edmund Rice College and will be transported by bus to the Short Course start. This is all part of your entry fee. The short course is still timed so you can see how you compare with other participants. Please note that the short course is limited to 400 participants. To enter the short course simply select this option when you register.